If you’ve ever been to Hong Kong before, you know that Hong Kong food is quite unique from the rest of the world. It’s well known that Hong Kong is one of the best places in the world to eat, and for good reason. You can find all different kinds of Chinese food around the city. 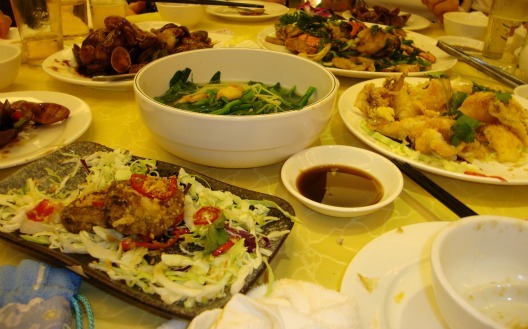 The Guangdong (Cantonese) style is the most popular Chinese Cuisine. This is because most Hong Kong citizens emigrated from Guangzhou (Canton) or their ancestors did. When they came over, they brought their cooking style with them. Along with the Cantonese food, influence from all around the world has brought many different types of foreign food including Western, Japanese, Korean, Thai, Vietnamese, Malaysian, Indian, Singaporean, Italian and French cuisines to Hong Kong. With such a wide variety of food to choose from, you have the freedom to try something new here or eat the food you’re used to eating. Click here to learn about Hong Kong Style Drinks. Even though certain Hong Kong food may be similar to what you’re used to, there are some noticeable differences when eating out. The portions of Hong Kong food given are a lot smaller than what is given in North American and European restaurants. When you order a drink with your meal, you’ll find that it’s a lot smaller than what you might be used to. Usually your drink is filled half way with ice to give you even less. If you ask for no ice in your drink, they may even charge you extra. You’ll find that napkins with your meal are very limited if given out at all. You may have to buy your own package of tissues or napkins and bring it with you in case the place you’re eating at doesn’t provide any. Times for eating in Hong Kong are fairly specific. They have 5 specific classifications for times of the day to eat. Sometimes you may find a special at a restaurant for only a few hours of the day. You don’t have to eat 5 times a day, but you may want to know that different food/portions are served at different times of the day. They have the usual breakfast, lunch and supper, but they also have afternoon tea and late night meals (siu yeh). Afternoon tea is a lighter meal served between lunch and supper at 3pm-5pm. This influence came from the British, who leased Hong Kong from 1841-1997. Late night meals or “siu yeh” is had any time after supper time until the early morning when breakfast is served. This can be a small snack or a big meal, depending on what you’re in the mood for. A lot of stores and restaurants are open late or 24 hours a day, making late night meals easily available. One of the most popular types of Cantonese food is Dim Sum. Most of this kind of food is steamed, and some of it is fried. The food comes out in little bamboo baskets or plates. Everyone usually shares all the food on the table with one another so that you get a good variety. There are 2 ways to order Dim Sum. The first way is to order directly off the order sheet given to you as soon as you sit down. Once you sit down at the table, you’ll notice there are people pushing carts around the restaurant. These people have cooked food in their cart that they will show you. When they walk by your table you can take something you like off the cart and they will mark it on your order sheet. This is the best way to pick something you want to try, but don’t know what it is or what it’s called. Popular Dim Sum includes steamed dumplings with shrimp or pork inside, pan fried dumplings, sticky rice, pork buns, egg tarts, Chinese donuts, chicken feet, different types of noodles and pork spare ribs. 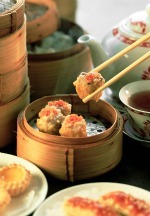 People in Hong Kong say “yum cha” (means “drink tea”) when they want to eat Dim Sum. Usually families or big groups of people eat Dim Sum on the weekends between 10am and 2pm. Popular Dim Sum Restaurants in Hong Kong include the Jumbo Kingdom Floating Restaurant and the Ocean City Restaurant. Bakeries are quite popular Hong Kong food. 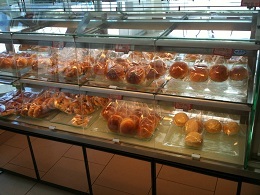 Here you can find all different kinds of Chinese pastries including egg tarts, pineapple buns, wife cakes, cream buns. These pastries are cooked fresh daily. During the Mid-Autumn Festival in September you’ll find all sorts of moon cakes for sale in the bakeries. Moon cakes are cakes made with lotus seed and duck egg filling to celebrate Moon Day, which happens in September every year. August 15 on lunar calendar. Hong Kong has its own type of fast food that’s quite unique from typical fast food chains. 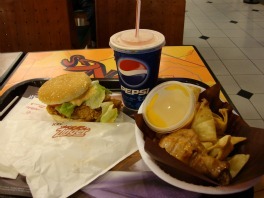 These fast food restaurants serve all different kinds of food throughout the day for a fairly cheap price. You’ll find Hong Kong food specialties and other choices from all around the world. These restaurants have seating like a typical fast food restaurant, but you may have a hard time finding a spot since these places can fill up very quickly at certain times of the day. A typical American breakfast would include steak or eggs, sausage, toast and a Hong Kong style drink for $20 HKD (between $2.50-$3.00 USD). Menu items are rotated daily and include a variety of Western and Chinese style dishes. Seasonal dishes are introduced throughout the year as well. 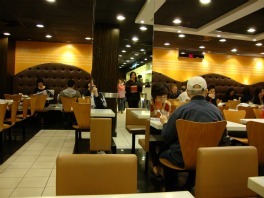 Fast food restaurants that serve Hong Kong Style Fast Food include Café de Coral, Maxim’s MX, and Fairwood. These places can be found all over Hong Kong. their dishes. Since they live next to the ocean, seafood is easily accessible. Some of the popular seafood in Hong Kong includes lobster, abalone, shark fin, crab, all different kinds of fish and shrimp. You can even eat very rare types of sea creatures like the horseshoe crab. 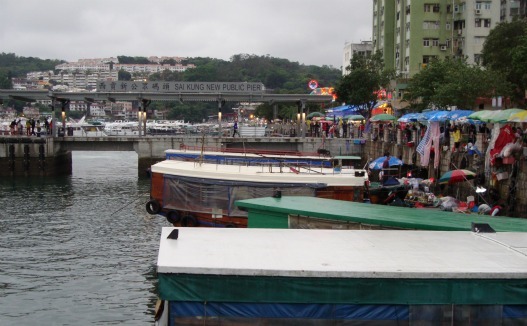 The most famous place to eat seafood in Hong Kong is Sai Kung Town. Sai Kung Town has many seafood restaurants along the street next to the waterfront. Here you can enjoy some of the best seafood in Hong Kong. Walk along the piers and order live seafood from off of fisherman’s boats. You’ll see lots of tanks filled with live sea creatures in front of nearby restaurants as well. You can pick your meal from these tanks and take it in to one of these restaurants to have it cooked for you. Seafood can’t get much fresher than eating it the day it was caught in the Ocean. 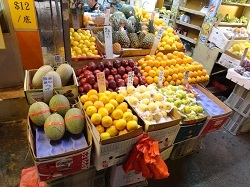 While walking around Hong Kong you may come across one of the many fruit stands on the street. Most fruit is more expensive in Hong Kong because they have to import it from China and Southeast Asian Countries. Locals enjoy eating fruit, and sometimes these fruit stands can become quite busy. Most fruit stands accept cash only. You’ll know when you’ve found one of these shops because they have whole pieces of animals hanging in the store window. A lot of people go to these shops to buy Barbeque pork for cooking at home. There are restaurants where you can order some of the Barbeque meat served as a dish. Barbeque meat has lots of flavour. 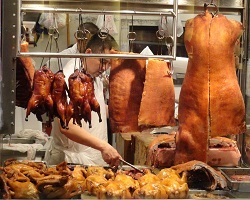 Once you try some of the meat, barbeque could become one of your favorite kinds of Hong Kong food. Another type of Hong Kong food is Hot Pot. Hot Pot involves a large pot of chicken broth that sits on top of a fire (usually a portable stove nowadays) where everyone gets to cook their own food. Hot water or specially flavoured hot pot broth is mixed into the pot with the chicken broth. 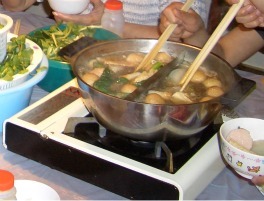 The hot pot is brought to a boil and then simmered, allowing everyone to add their food to the pot to cook it. Once it’s cooked, you put it in your bowl and dip it in some hot pot dipping sauce. hot water and cooked. Other kinds of food put in a hot pot include shrimp, dumplings, crab, squid, mushrooms, wontons, nappa, Chinese cabbage , and different kinds of leafy Chinese vegetables. People have cold drinks while cooking hot pot. The hot pot meat cooks quite quickly, so make sure to keep an eye on it. Eating all these traditional Hong Kong food choices is great, but sometimes you may want to eat something a little more familiar. Hong Kong has a lot of the western chain fast food restaurants such as McDonalds, KFC, Burger King and Pizza Hut. You can find these in shopping malls and on the street. These fast food restaurants have bigger dining areas and look a little classier than what you would find in North America. You can still get a Big Mac at McDonalds or a Whopper from Burger King, but the menus have a few differences from the North American fast food restaurants. Some of these different items include a shrimp burger and a pork burger (a real “ham”burger). These are the most popular kinds of Hong Kong food that you may encounter in restaurants and stores. With so many popular dishes to choose from, it’s no wonder eating is such an important part of the Chinese lifestyle. And after trying the food, maybe the whole reason you come back to Hong Kong in the future is to eat more of their great Hong Kong food. What's Your Favourite Hong Kong Food? Is there something you just have to eat when you're in Hong Kong? Write about it!